It wouldn’t be the Cobber Challenge if there wasn’t a last-minute substitution, or so it seems. Last year northern NSW entrant Lily was swapped out at the 11th hour when she needed to put her paws up to rest for the final few weeks before her litter of lively Border Collie pups was born. And now impending motherhood has brought this year’s Challenge to an early end for Queensland Kelpie-Collie cross Storm. Four-year-old Storm was all set to compete with her human handler Christian Bjelke-Petersen, Kingaroy, but was withdrawn the weekend before the challenge, when she came into heat. Storm’s not expecting quite yet but her potential puppy-daddy has been chosen and, all being well, the canine couple could have some happy news to share before too long. Christian has been planning for some time to breed from Storm but hadn’t banked on the opportunity presenting itself right on the eve of the Cobber Challenge. “I’m heading up north again at the end of the month to do a couple of weeks of mustering. They all have dogs that they work with as well. It might have been okay by then but I couldn’t be sure; I didn’t want to run the risk,” Christian said. In her place, on Friday he nominated another member of his A-team to step in: Razor. 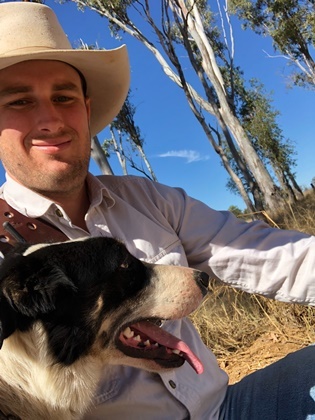 A two-year-old tri-colour Border Collie, Razor has been helping Christian in his contract mustering business for just over 12 months. His love of getting in close to livestock is the perfect complement to Storm’s natural preference for working wider. “Razor reads stock like a book and only needs to move his body in order to hold them right where he needs them,” Christian says. “He’s just a good honest worker. Razor also carries an impressive pedigree. The son of a Border Collie imported from the US and joined to a well-proven Australian working dog line, Razor was sold as a yearling purely because his breeder could not use him in his own gene-pool. Normally his serenades are aimed squarely at Christian but with Storm now in the mood for romance Razor’s crooning may be redirected. The two are currently sharing a kennel at Kingaroy in the hope the next generation of cattle dogs will be conceived. She might be out of the running to be crowned this year’s Cobber champion but, nine weeks from now, give or take a day or two, Storm could well have motherhood stories of her own to swap with Lily if ever the two get together to chat about their Cobber Challenges that “almost were”.